Heat 30 g butter and roast the diced shallot gently. Add horseradish and 0,5 litre vegetable stock. Cook for 20 minutes. 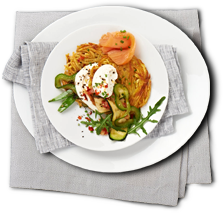 Puree the soup and filter it through a fine strainer, add the cream and Exquisa cream cheese with natural yogurt and season with salt and pepper. Dice apples and beetroot and roast in 15 g butter with ground coriander. Add white wine and cook for 10 minutes. Add remaining vegetable stock and cook for a further 20 minutes. Puree and filter through a strainer, season with salt, pepper and lemon juice. Chop dill and keep a few tops for decoration. Mix Exquisa creamy natural quark with skimmed milk and chopped dill. To serve, fill each soup in a bowl equally. 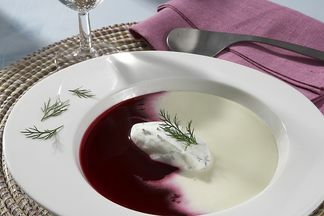 Put a tablespoon of fromage frais into the soup and decorate it with the remaining dill.